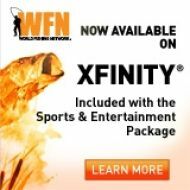 WFN: World Fishing Network, North America's only television network, online and mobile platform dedicated exclusively to fishing and outdoor enthusiasts, announced today that it will be available to Comcast's XFINITY TV customers after a multi-region rollout taking place through the summer. By the end of the rollout, WFN will be available to over 40 million multichannel households in North America through multiple video providers. WFN will be added as part of the Sports & Entertainment package throughout the Central and Southern U.S., as well as Eastern Pennsylvania, New Jersey, Minnesota, Arizona and Utah. Customers interested in receiving WFN can call 1-800-XFINITY to order, or visit www.xfinitytv.comcast.net for additional information. "We are proud to bring fishing entertainment to this vast area of the U.S.," said Mark Rubinstein, President & CEO of WFN. "From Chicago to Florida, anglers will enjoy the variety of programming that only WFN can offer." WFN provides a daily escape for North America's 44 million recreational and sport fishing enthusiasts with a comprehensive programming line-up that includes travel, lifestyle, sportfishing, tournament coverage, and more. There's something for every angler and it's easy to find with "WFN Theme Nights," each evening's prime-time block of programming dedicated to various aspects of the pastime: Big Bass Monday, Fly Fishing Tuesday, Offshore Wednesday, Inshore Thursday, Freshwater Friday, and World Fishing Saturday. "Comcast provides customers with quality and entertaining programs for outdoor enthusiasts," said Lars Lofas, Vice President of Product Management for Comcast's West Division. "We are pleased to offer WFN and expand our array of viewing options." To find out if WFN is available on their cable system, customers can visit www.WorldFishingNetwork.com/GetWFN.